This eggplant-based veggie chopped liver is so delicious that you won't mind the frying it requires. 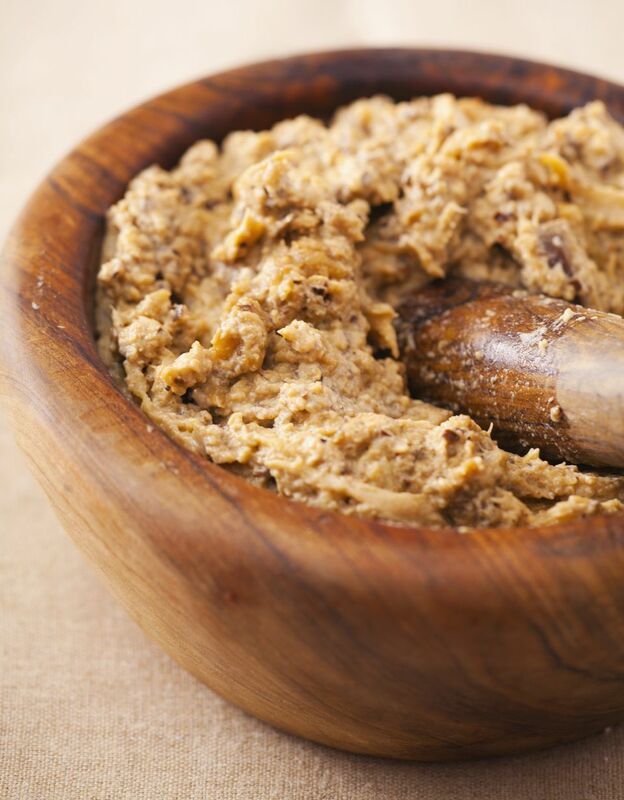 Sure to become a family favorite, this version is one of many dairy-free takes on mock chopped liver. Try it as a sandwich spread on challah, or serve as an appetizer dip with pita or rye bread, crackers, and veggie crudités. If you're entertaining, offer it alongside a couple of other vegetarian dips, like the Moroccan tomato and pepper-based Matboucha, and great guacamole. Pat the eggplant pieces dry with a paper towel, then sprinkle both sides of the eggplant with flour. In a large frying pan, pour enough oil to generously cover the bottom of the pan. Warm until hot, but not smoking, over medium-high heat. Place half of the eggplant slices in a single layer in the hot oil. Fry until dark brown. Turn and fry on the other side until dark brown. Remove to a paper towel, and pat with another paper towel to remove excess oil. Fry the rest of the eggplant as described above, then set the fried eggplant aside to cool. Add the chopped onions and garlic to the frying pan, which will still have oil in it from frying the eggplant. Sauté until softened, about 5 minutes, the lower the heat and continue to cook, occasionally tossing, until the onions begin to caramelize, about 5 to 8 minutes more. Place the fried eggplant, onions and garlic in a food processor. Add the hard-boiled eggs. Process until the spread is smooth. Season with the salt and pepper. Transfer the mixture to an airtight container, and refrigerate for several hours before serving.